If you want to grow your business, you have to know how to create an effective landing page. Landing pages are ways to exchange information between a customer and business, and they provide a lot of room for variety. For example, a marketing company might offer a downloadable eGuide on ways to increase conversion rates if a site visitor subscribes to its blog. Likewise, a home decor company could offer a free design consultation in exchange for the visitor’s contact information. But people are cautious about handing out their private information. This is where the power of an effective landing page comes into play. Do you know the secrets to creating one? Let’s find out. Consider Adding More Fields to Your Form. Many marketing gurus encourage businesses to cut down on the number of entry fields on a landing page because long forms translate to fewer sign-ups. However, this advice has two major flaws. First, it prioritizes quantity over quality. Only those dedicated enough will complete longer forms. Yes, this means you’ll receive fewer sign-ups but in the long run that means better subscription and click-through analytics. Second, if you pare down your form too much, entries for a name, email address and phone number – the three most difficult pieces of information for a customer to part with – are all that will be left. This is equally unpleasant for customers. A much better approach is to add a few more meaningful entries to your forms. Take for example the landing page for Advanced Grass, an artificial-turf installer. Instead of taking the traditional route, Advanced Grass asks customers to fill in details about the project they are working on in order to receive a quote. Thus, the form states its purpose for requesting contact information (to deliver the quote), quelling the fear that salespeople simply want to solicit products their way. In general, simple landing pages look better and lead to higher conversion rates. However, make sure your simplicity isn’t compromising information. Wistia, a video marketing platform, provides a great example of how to avoid such a problem. Its sign-up form is clear and concise with a tranquil blue background that sharply contrasts the white entry slots. The page also includes a set of Frequently Asked Questions right below the fold – no searching, clicking or loading necessary, thereby saving any trouble for the customer. 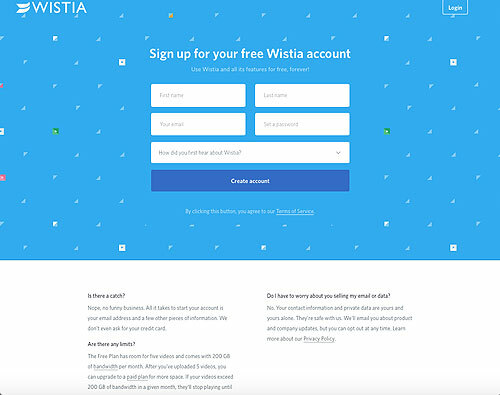 There’s not much to it, but Wistia’s form proves that a landing page can be both informative and simple. The CTA is the most important part of your landing page, so don’t be afraid to use bold, large fonts to make clear what you want visitors to do. Unfortunately, many marketers incorrectly assume that because a CTA needs to be clear, it can be generic. That thinking couldn’t be farther from the truth. Every word on the page is an opportunity to solidify your brand’s theme and if the CTA is most important, why should it shortchanged? 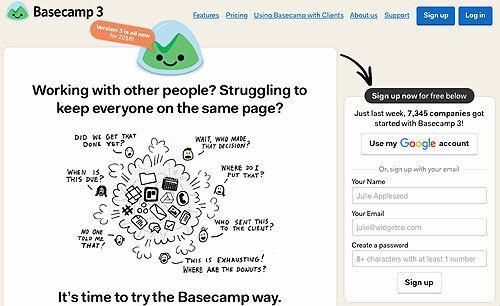 Basecamp’s CTA not only boldly directs customers to sign up for its software but also includes playful graphics to show the company is no run-of-the-mill platform. Finally, pay attention to the details. They may not be the most important, but getting them tuned just right will surely help your website stand out. Ideas you might want to experiment with include adding icons next to each entry field or incorporating graphics and/or a strategic color palette to guide visitors through your form. Again, take a look at Basecamp’s site. It includes a fun illustration to highlight its updated 2016 software as well as an arrow from the main CTA to the sign-up form. Notice how the CTA, arrow and “Sign up now” header are the same shade of black to guide the visitor’s eyes and connect the separate elements. The next time you look at a landing page form, ask yourself what you like and don’t like about it. Do you find the page easy to follow? Is the CTA powerful? Does the design work? They aren’t something consumers consciously think about, but the text and design elements of landing pages are key to customer conversions. If you’re looking to optimize your landing page, we can help! Contact San Diego Media today at 1.800.808.8696 or by filling out this brief e-form.